The easiest way to describe this style? Congratulations! It's a Belgian IPA. This hybrid of beer is a relatively new style and doesn't reach as far back into history as its components. It's a great beer to bridge the gap between hop heads and Belgian beer fans. Ask Berry White...he'll tell you. 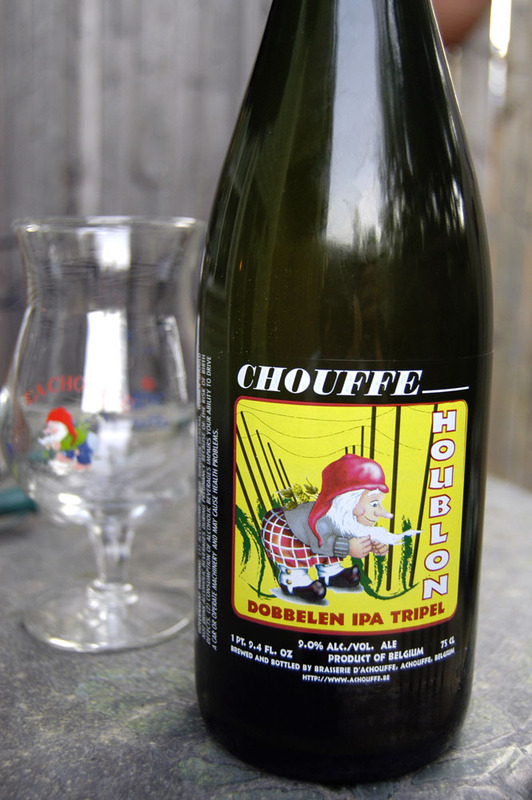 Today's demonstration beer is Houblon Chouffe Dobbelon IPA (or simply Houblon, as we call it at home) from Brasserie d'Achouffe in Achouffe, Belgium. 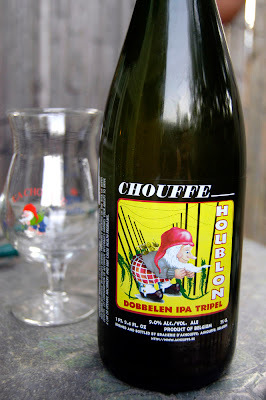 While I try not to sway people with ratings, Houblon earned a 99 out of 100 on Ratebeer and a steady A- rating on Beeradvocate for a reason. This beer rules the school. 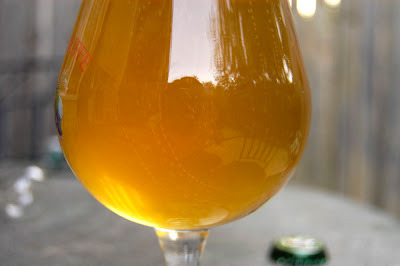 Houblon has a beautiful, hazy gold color and a thick, sudsy head. It's enough to make your eyes (or mouth) water. The aroma is fruity, slightly funky and in-your-face. The initial taste adds a whole new layer of complexity: yeasty, a bit of citrus and some grassiness which gives it a nice, earthy flavor to balance out some of the booziness and malty sweetness. The finish is crisp and dry, with a bit of lingering hop on the tongue. It's like the tripel welcomes you to the party and the IPA sends you home with a little goody bag. Now go and experience one! Oh, and there's one more style of IPA to cover then we're moving on to seasonals. 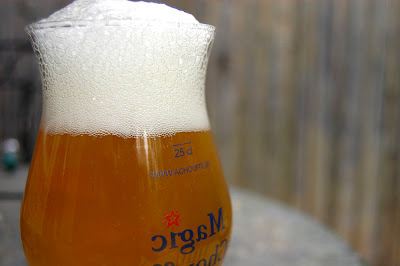 A warning for next week's beer breakdown: make sure your tastebuds wear protective gear. They're going to need it. I'm sure your palate has had plenty of practice over at the new TNT restaurant in Clarendon. But which one will it be? Muahaha. Mmmm--I love fruity beers. Great pictures. I love goody bags. Couldn't have described this better myself. Just jealous that I missed out on the hops of your blog labor. Margie - did you know the Travelocity gnome is actually from Belgium? Okay, I made that up. Mike - we'll make up for it. I think we're about due for some Hugh Malone again, too. 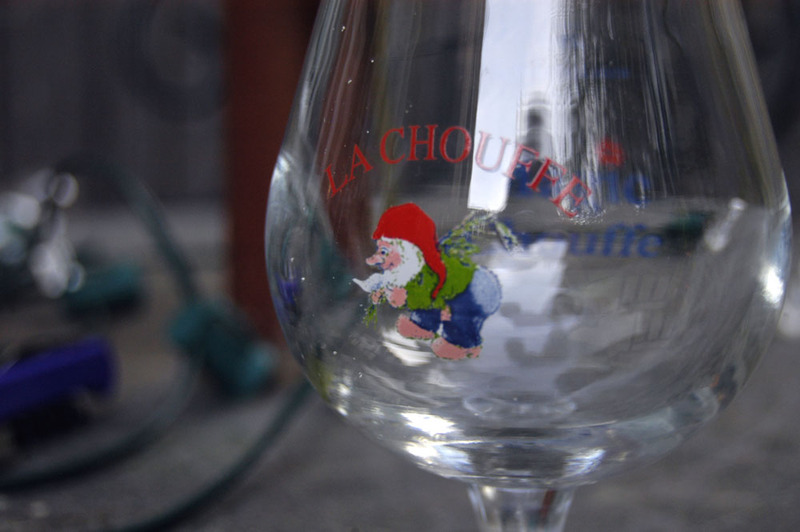 I would drink that only because there is a little gnome on the bottle. Ali I picked one these up last weekend from the Belgian beer fest I can't wait to open mine up! Rick - the gnome will always getcha in the end.